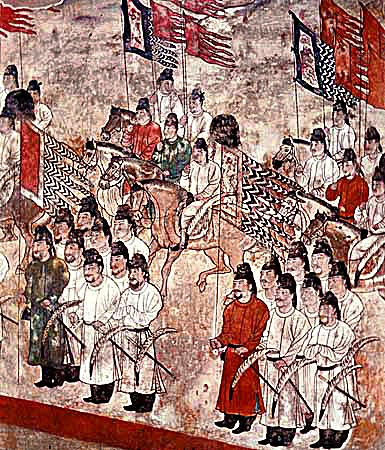 The Imperial Guards of the Tang Dynasty, also known as "Forbidden Troops" (traditional chinese: 禁軍, simplified Chinese: 禁军: jìn jūn), evolved initially from honour bodyguards of the emperor and garrison of the Imperial capitals during its formation in early 7th century, into the only military force that remained under the control of the central authorities after the An Lushan Rebellion. 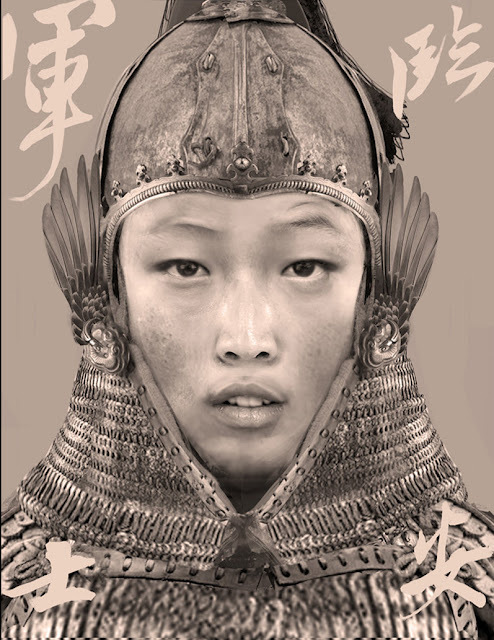 Tang dynasty soldier in heavy lamellar armor- the winged cheekpieces designate that he is from the late Tang dynasty. 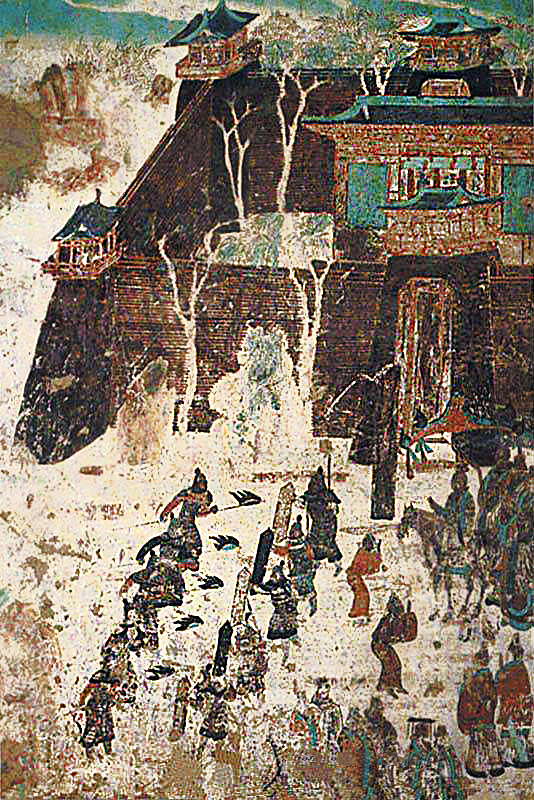 Mogao caves: rows of armored guardsmen in a mock battle drill or openly clashing with one another. They are equipped with pennoned banners and lacquered wooden shields. Their helmets are marked by a metal ball. 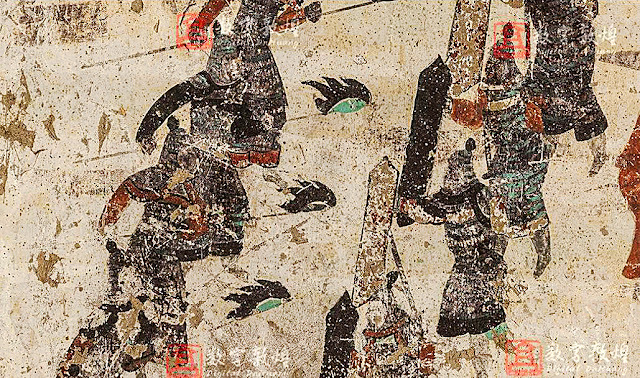 They are also equipped with swords (Tang dao) on their left side. 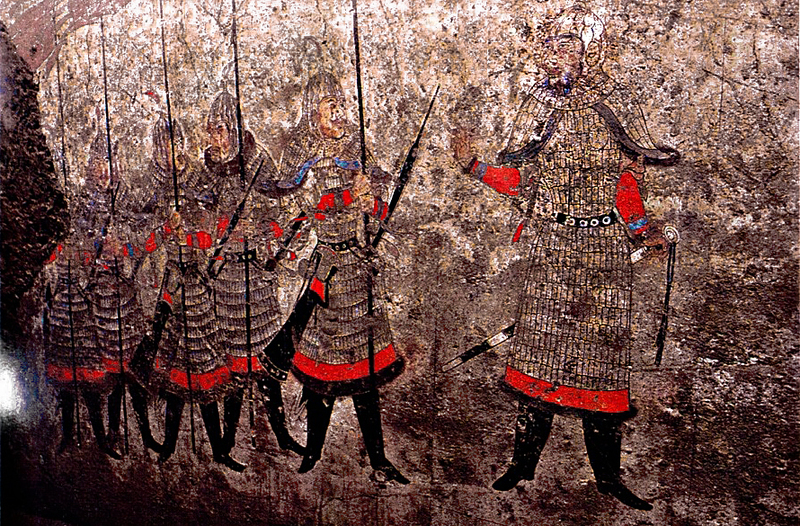 Tang imperial guards depicted on the tomb relief of Li Chongrun, Crown Prince Yide, the son of Emperor Zhongzong and the infamous Empress Wei. 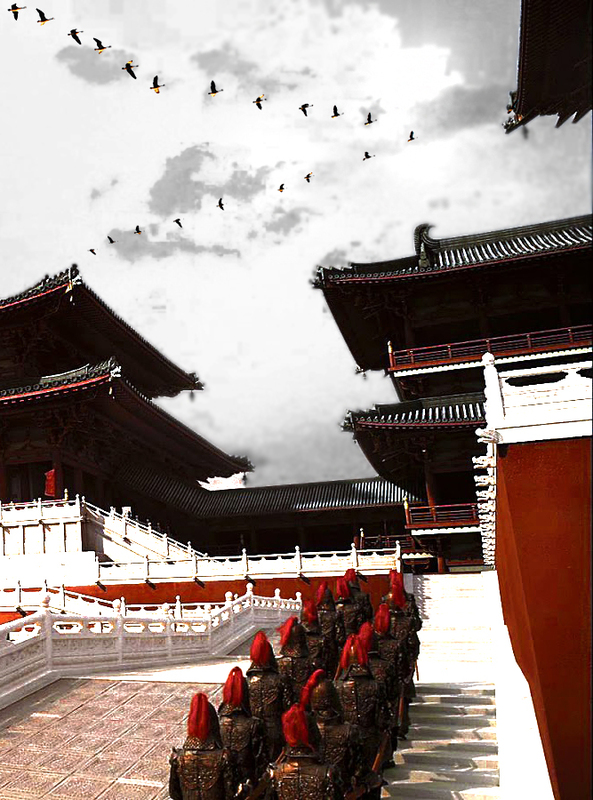 Prince Li Chongrun- who never ascended the throne was forced to commit suicide by his grandmather, Empress Wu Zetian. 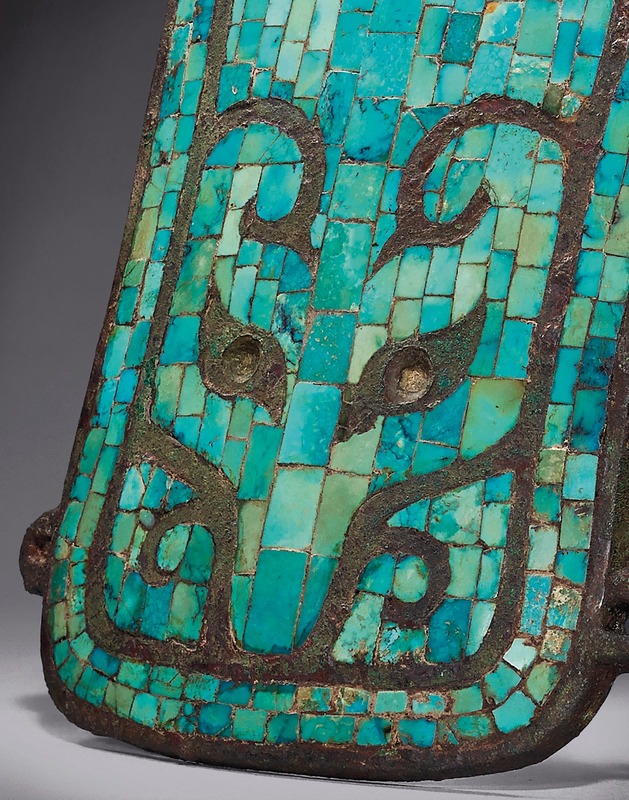 The honor guards of Crown Prince Yide, on his tomb relif, AD 706. Note the black and white cheveron stripped pennons. 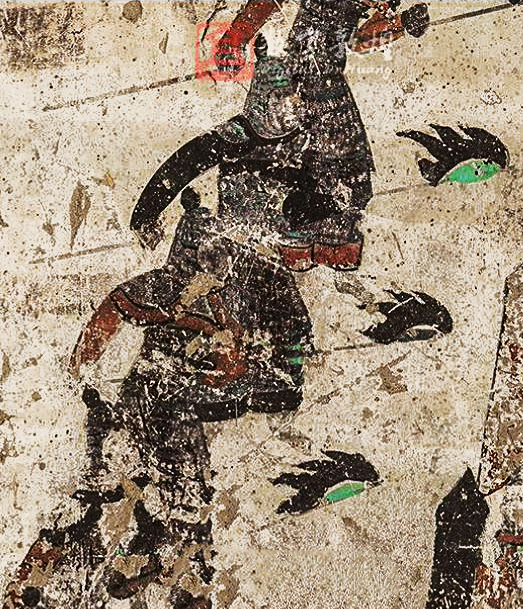 The black and white chevron stripes predates that of the Tang dynasty and was seen as early as the Northern Wei and Northern Qi period, likely a pattern originated from the steppe cultures of the north, nonetheless the Tang incorporated the motif and became a fixture of Tang dynasty armies. What is the Chinese character on the flag? "楊" One of the warrior clans of the Five Dynasties and Ten Kingdoms which immediately followed the collapse of the Tang dynasty, they would become legendary as the vanguard of the Song dynasty. 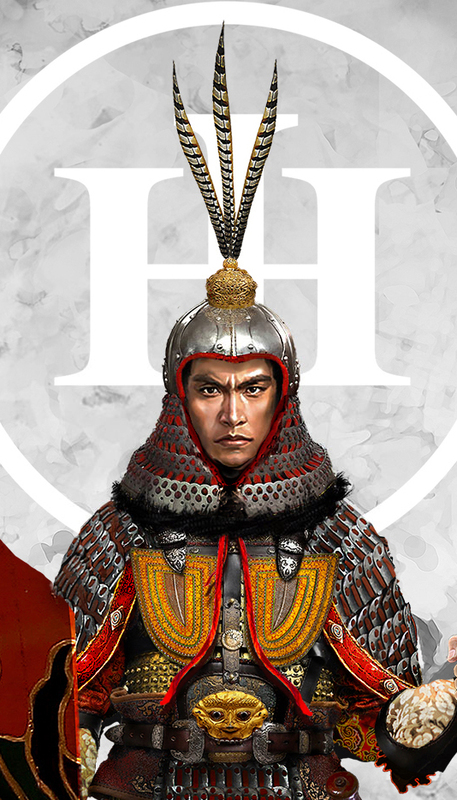 The black and white chevron stripes designate that the unit as one of the lifeguards of an imperial Prince. 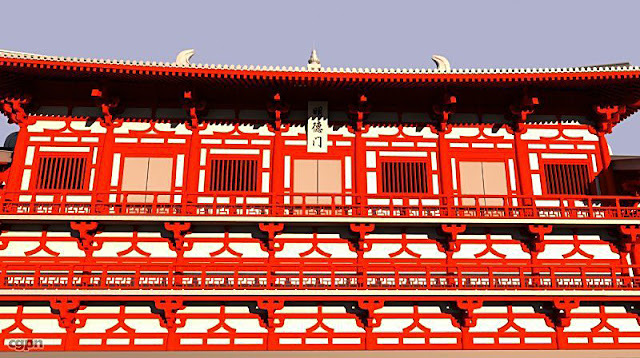 One such unit was the guards for the disgraced Li Chongrun, Crown Prince Yide- son of Emperor Zhongzong and Empress Wei who was forced to commit suicide. 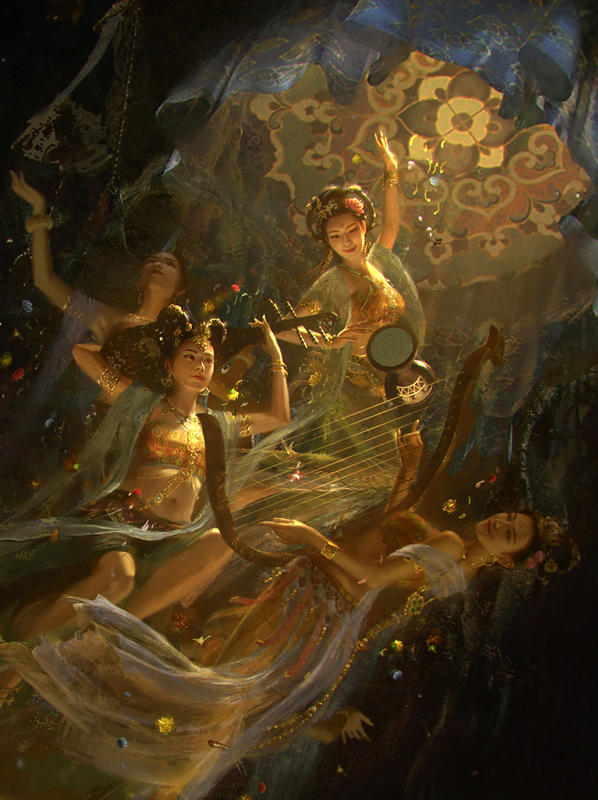 The famous Yang clan of the Song Dynasty, legendary. What were the other clans? 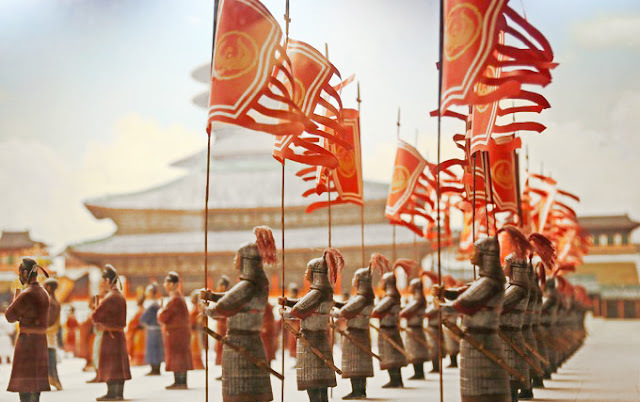 Well, that's very easy, if they are good at war, preserving power, and surviving, they'd all became major warlords (heads of kingdoms) when the Tang split into many many different kingdoms in the Five Dynasties and 10 Kingdoms period. Just check out each of the Kingdom's family and patriarch and you will have a good idea. Truth be told, the situation at the end of the Tang China is somewhat similar to Japan before the Gempei War and the Sengoku era- the central court virtually has no authority and the regional military governors virtually has total autonomy in their region: The Jiedushi class- military governors could have almost became like the samurai. 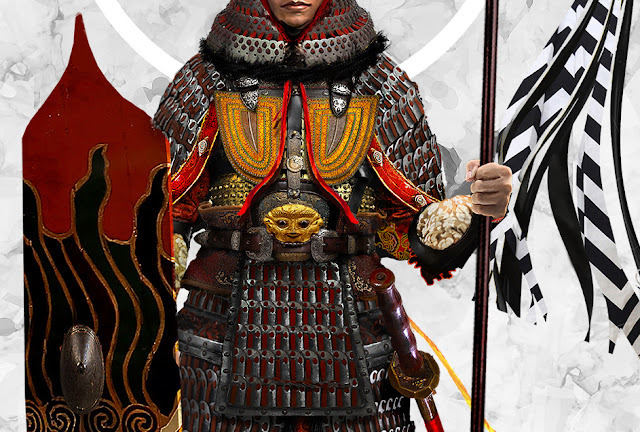 Or more precisely, Daimyos with regional armies (which is what the country got for the next 70 years of on going civil war) but I guess that China didn't became an entrenched feudal warrior dominated society is because 1. 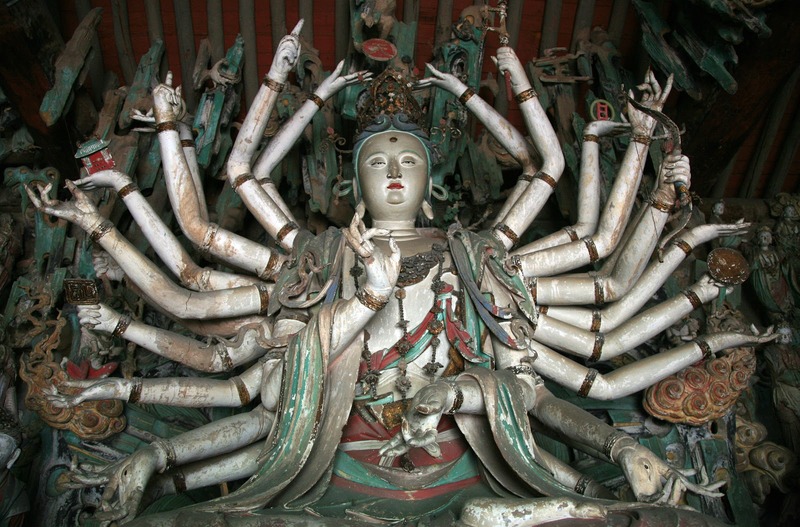 China always default back to a unified one- polity- one dynasty rule, 2. that there isn't an equivalent warrior aristocrat class. 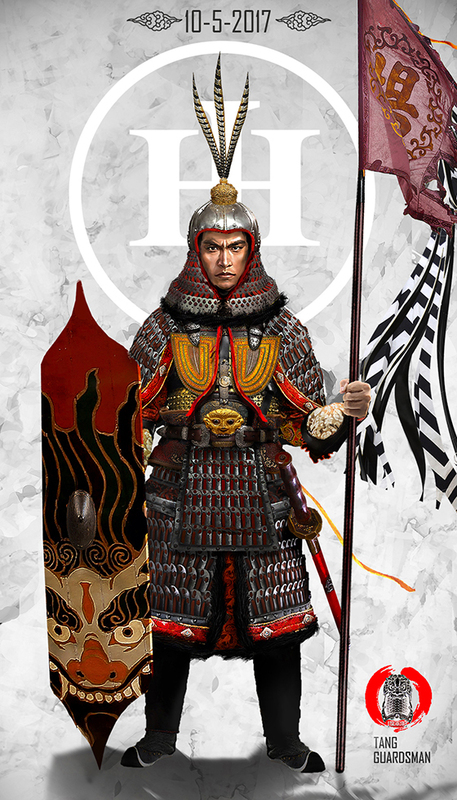 The Jiedushi were in all matters hereditary warlords with hereditary domains/ fiefs, but their followers are still organized like mini kingdoms where the central clan's rule is absolute and the hierarchies below are under their total control- without a specific class of warrior- aristocrats (samurai) ruling specific local domains autonomously.